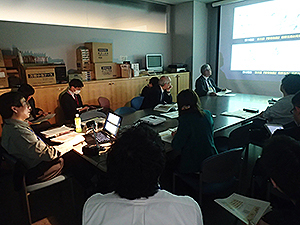 As a part of the comprehensive study meeting program for the researchers of the Institute, the lecture meeting of TANAKA Atsushi (Deputy Director General) who was retiring at the end of this fiscal year was held on March 1st. Tanaka has been with the Institute since 1994 and engaged in research study on the contemporary art and published many literatures concerning Japanese modern Western paintings especially in the Meiji and Taisho eras. His books include “TAIYO TO JINTAN: Aspects of Japanese post-impressionism and modernism, 1912-1945” (Brücke Co., Ltd., 2012). In the lecture titled “The substratum of the modern Japanese art ― with the focus on KISHIDA Ryusei,” the relationship between KISHIDA Ryusei as an artist of Western painting and the collectors surrounding him was viewed and discussed as the “substratum” that had supported his creative work. Tanaka’s view has deep-rooted in his research approach that was adopted in the above literary works and that he has developed over the past years. 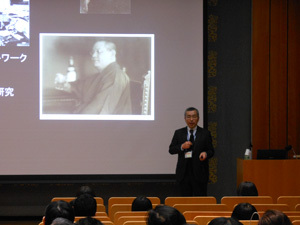 Furthermore, his lecture using abundant materials based on solid research has revealed that Kishida’s network with SUMITOMO Kanichi who was the eldest son of SUMITOMO Shunsui (the founder of the present Sumitomo Group and a well-known art collector), ODAKA Sennosuke who was a staff member of the Institute of Art Research (the predecessor of the National Research Institute for Cultural Properties, Tokyo), and others led the artist of Western painting to become an ardent admirer of the Eastern art such as Ming & Xing-era paintings and Ukiyo-e. In addition to the Institute’s staff members, the lecture meeting was also attended by many former staff members of the Institute who used to work with Tanaka. A reception was held after the lecture, which was filled with a warm and friendly atmosphere just like that of an alumni reunion. After retirement, Tanaka will continue to support the Institute as its honorary fellow and a visiting researcher of the Department of Art Research, Archives and Information Systems. The National Research Institute for Cultural Properties, Tokyo established the Archives Working Group in FY2013 to make further efforts to widely and effectively transmit the results of various studies on cultural properties that the Institute has worked on. In FY2014, as a part of the efforts above mentioned, a new system was established to organize a vast amount of research information/information resources and facilitate their disclosure. Furthermore, the existing retrieval system for the material database of the Institute was renewed as “TOBUNKEN Research Collections” ( http://www.tobunken.go.jp/archives/). Users comment favorably that a scope of accessible information has expanded as the retrieval of variety of information related to cultural assets has become facilitated. 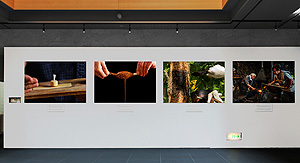 In FY2015, with the aim of providing the entire list of research products that have been published by the Institute since its foundation till today, a new page “List of Publications of the National Research Institute for Cultural Properties, Tokyo” (http://www.tobunken.go.jp/japanese/publication/index.html ) was added to the Institute’s website. Based on this list of research products, it is planned to sequentially post those research products which can be published on the website (as PDF files etc.). In addition to the Institute’s website, those research products will also be included in the “open access repository” currently being promoted by the National Institute of Informatics, thereby developing a usage environment open to more people. Nowadays, “opening of academic information on natural science” seems to be entering the new phase, where the Cabinet Office issued the open science policy. The Archives Working Group is planning to hold an active discussion also on how to handle the experimental data, useful illustrations, etc. in the field of natural science that have not been able to be sufficiently included in the paper medium. Once a month, by inviting not only the Institute’s staff members but also researchers from other institutions as the presenters, the Department of Art Research, Archives and Information Systems holds a seminar to discuss cultural assets mainly focusing on arts and crafts. On Tuesday, 29th March, Yoshiya YAMASHITA (Curator of Japanese Painting of the Tokyo National Museum) delivered a presentation under the title mentioned above. This Emaki, owned by the Sumo Museum in Ryogoku, has an overall length of over 12 meters. Its existence had not been well known until it was recognized as a Sansetsu’s work and was displayed and publicly shown in the special exhibition “Kano Sanraku and Sansetsu” (March 30th to May 12th 2013) that Yamashita organized during his tenure at the Kyoto National Museum. First, the presentation has drawn attention to the Japanese style motif that changed the previous image of Sansetsu having been created based on the works of Chinese type motifs. Then, the scenes that depicted the moments of various sumo techniques such as “Kawazu-gake” winning technique and the viewers’ excitement were explained in detail and Sansetsu’s characteristics were confirmed from his way of depicting portraits, including especially the faces and looks. Further, focusing on the postscript by his heir Einoh, the presenter gave his view on the issue of Sansetsu’s supporters and the background of the birth of this Emaki. A team of experts was dispatched to Nepal on a further four occasions up to March 2016 for the Investigation of Damaged Cultural Heritage in Nepal, which was introduced in the last issue and was conducted under the Project for International Contribution to Cultural Heritage Protection, which was commissioned by the Agency for Cultural Affairs of Japan. The experts engaged mainly in the following activities. The experts checked the state of damage to traditional buildings centering on Dubar Square, which is part of the World Heritage site of Kathmandu Valley. Aganchen Temple (partially damaged) and the Shiva Temple (totally collapsed), both located inside Hanumandhoka Palace, were selected as the target of detailed surveys. 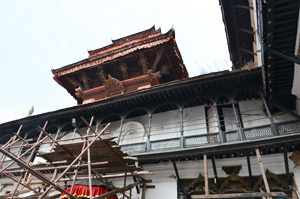 Among others, a survey was conducted on the distinctive traditional building techniques of the Newar culture, including building elements that had been revealed for the first time by the damage, such as the timber pillars concealed inside brick walls. Regarding Aganchen Temple in particular, the experts conducted measurement surveys, checked the state of damage in detail, and studied past alterations in order to assess the present situation and assist the restoration. The experts conducted surveys mainly on two multi-tiered tower-style temples in the square, including measurements using a 3D laser scanner, a detailed investigation of the state of damage, and measurement of their vibration characteristics. Using a model compiled on the basis of the results, they carried out a structural analysis and examined the damage mechanism and other issues. The team of experts sorted, stored, and documented architectural members retrieved from the collapsed building of the Shiva Temple and offered advice on work methods to personnel of Nepal’s Department of Archeology and other organizations. All of the components were arranged by type and stored in temporary shelters, and a survey was conducted on the state of damage to each part as well as on past modification of the building. The experts also visited the village of Khokana, which has an old townscape and is registered on the World Heritage Tentative List, investigating the state of damage, the transformation of housing up to the present, and the village’s intangible heritage value such as those of various cultural spaces. Here they carried out the survey in collaboration and cooperation with a local residents’ organization that is making strenuous effort both to reconstruct lives as quickly as possible and preserve the historical townscape. 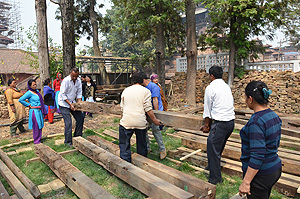 Meanwhile, three Nepalese engaged in the preservation of cultural heritage in the Nepalese government and the UNESCO office in Nepal were invited to Japan in February 2016 for the seminar on Cultural Heritage Damaged by the 2015 Nepal Gorkha Earthquake, which was held at the National Research Institute for Cultural Properties, Tokyo on February 5th. At the seminar, the three Nepalese invitees gave presentations on the situation after the earthquake, restoration measures, and other issues, and then the Japanese experts participating in the project gave interim reports on survey results in their respective special fields. As difficult conditions continued to prevail in Nepal, the two sides were able to share the latest information and, through discussions, exchange opinions on how to respond to damaged cultural heritage and so on. Through such cooperation, we hope to continue providing appropriate assistance to Nepal’s efforts to restore damaged cultural heritage and transferring Japanese technology, such as survey methods for the repair of cultural properties.